A new crossover SUV for Dodge, the midsize Journey is essentially a tall station wagon. The Journey can haul up to seven passengers, although the standard configuration seats five. Dodge offers three different engines: a 173-bhp 2.4L I-4, a 186-bhp 2.7L V-6, and a 235-bhp 3.5L V-6. The smaller engines are equipped with a 4-speed automatic, while the 3.5L gets a 6-speed automatic. The Journey is available in FWD or with on-demand AWD (3.5L only). Available features and options include: rearview camera, beverage cooler, multiple 12V and 115V outlets, remote start, rear seat DVD entertainment system, and reconfigurable seating, load floor and storage bins. Families that need a more compact and affordable alternative to the Dodge Caravan will find the Journey is a perfect fit. 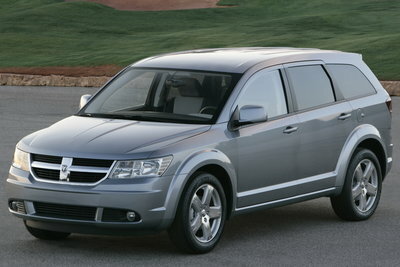 The Dodge Journey is an all-new crossover vehicle with three rows of seating for up to seven passengers. The Journey is conceptually a wagon version of the Avenger sedan, but rides on a 5-inch longer wheelbase. In the US, the Journey offers a choice of 2.4L four-cylinder, or 3.5L V6 power. All-wheel-drive is available.